Last time I posted a list of the most popular file/folder backup tools. This time, I’ll look at Windows backup tools that fall into the categories: drive imaging, file/folder synchronization, and online storage. NOTE: This post is just a survey of available tools, rather than a review. I’ve used some, but not all, of the tools listed. Backing up your files and folders should be just a part of your overall backup strategy, but not the entire strategy. A complete approach would likely include some use of full system backups (imaging), as well as synchronization and online backups. The tools in these other categories (imaging, synchronization, and online backup) address some of the shortcomings of traditional file/folder backup tools. In addition to periodically backing up your data files, you should consider doing a full disk backup, or image backup. Traditional file/folder backup tools typically don’t support backing up an entire disk or partition. These products are all very similar, but there are a few differences. 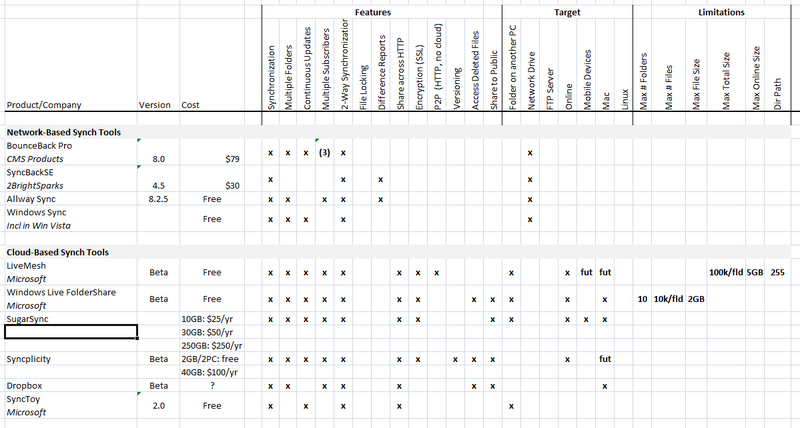 My list of available features is based on the documentation on each product’s web site. The goal of synchronization tools isn’t to create a backup of a directory, but to create a copy of that directory on other devices. Typically, one PC shares one or more directories, making them visible to the tool or service. Other devices subscribe to the shared folder and then replicate the contents locally. What makes synchronization tools so powerful is their ability to do continuous/live updates. When someone changes a file in a shared folder, that change is replicated across all of the subscribing PCs immediately. This gives us the benefits of both shared network drives and remote backups—users on other machines have access to the data at all times and can edit it from their machine. And the data is also backed up, in that it’s stored in multiple locations. Traditional synchronization tools worked only with devices that were directly networked on a LAN. But modern synchronization tools are more commonly delivered as a web-based services that synchronize machines via HTTP. A PC shares a folder to the service, causing the files to get replicated in “the cloud”. And then other devices can in turn sync to the same folder, allowing the files to get downloaded to the subscribing device. This “cloud” approach allows doing online backups in addition to synchronizing files across devices. This is a nice blending of traditional synchronization tools with online backup tools. Microsoft’s new LiveMesh platform offers maybe the best combination of features spanning both synchronization and online backup. For each folder added to the mesh, the user can choose exactly which devices to synch the contents to—including both physical devices in the mesh, as well as the online storage area. This allows doing peer-to-peer synchronization for some data, and online backup for other data. 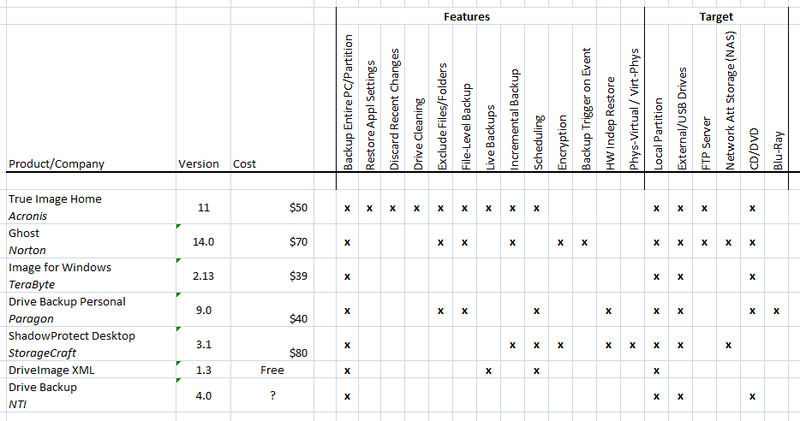 There are many more network-only synchronization tools available than I list in this chart. Given the power of the newer tools that also provide online backup, these older tools are becoming less popular. With easy access to highspeed Internet access these days, it’s clear that online backup, rather than network-only backup, is the preferred choice for most people. And with storage prices continuing to drop, these services are becoming affordable, even for storing huge amounts of data, like photos & videos. At the moment, I’m personally using a combination of LiveMesh and JungleDisk for my backups. Next time, I’ll describe how I use these tools. That’s an interesting post, thanks Sean! Incidentally, ShadowProtect does support Live Backups (if by “Live Backups” you mean the ability to image/backup your system without stopping any of your applications and without shutting down your operating system). ShadowProtect also supports imaging to (and restoring from) CD, DVD, and Blu-ray. I’m sorry if our docs didn’t make that clear. I’m a big fan of online backup – particularly for business data. As far as I’m concerned backups need to be automatic, and they need to be off-site. Anything less than this still leaves you vulnerable to data loss. One important consideration when choosing an online backup service is whether multiple PCs are supported. I’ve been using Angel Backup – http://www.angelbackup.com – for over a year now to back up all my business PCs. I’ll never go back to manual tape backups now. Online is the way to go – automatic, secure and off-site!